The following is a guest blog post written by Jeri Norris, Owner of By Design LLC. Jeri is a Certified Residential Interior Designer with an Interior Design Degree from the Art Institute of Indianapolis. She specializes in the design and remodel of kitchens and bathrooms. One of my favorite things in the world is to help people breathe life into their living spaces. We get tired of the same old decor, some of which we may have had for decades. The new year is a great time to do some freshening up! As a new home owner, you might be looking for some cheap ways to decorate your new house. On the other hand, if your house is on the market, there are some small things you can do that may make a huge difference when it comes to selling your home. Thankfully, there are some easy (and reasonably-priced) ways to freshen up your home. People oftentimes think of the kitchen and automatically assume that any changes are going to be expensive. However, what people don't realize is that you can replace your kitchen counters (and bathroom ones, too) fairly cheaply. When people purchase a full slab for their kitchen, they will often have leftover granite. Companies are eager to sell these (usually inexpensively) since they are so small. A quick and easy way to add some life to your kitchen is to add a backsplash. Whether you piece together your own or get pre-designed sections of tile from Lowe's, a backsplash adds so much character to a space and ties together the cabinets and the countertops. A word of warning: You can try to install your own backsplash, but by the time you purchase a wet saw, practice (including the waste involved), you may as well have paid someone to do this for you. Fabric is a broad term that encompasses everything from window treatments to your beddom to pillows, to fabric-covered headboards. Every room should have fabric in it, especially the bathroom in order to add some softness to what can easily become a cold, sterile space. If you want to update your comforter, don't throw it away. You can easily make a custom duvet to put over it. Similarly, you can refabric accent pillows (or replace the inserts if the pillows are no longer fluffy to your liking). 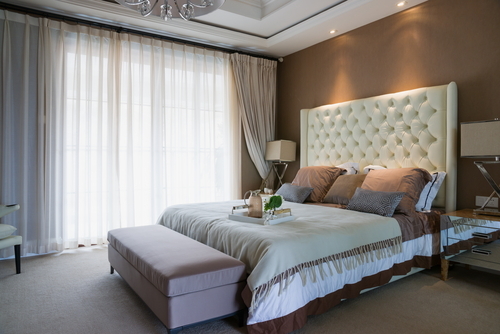 Fabric-covered headboards can make a dramatic change to any bedroom. Lighting does not just have to be overhead. It's a simple, inexpensive thing you can do to add some mood lighting to any room. Add lamps (floor lamps or table lamps) - or you might consider putting some wall sconces by your bed to use as reading lights. Chandeliers make a fabulous addition to any room! Redecorating doesn't have to be difficult or expensive. But if it happens to be frustrating for you, give me a call. I offer 1-hour free, in home consultations and am happy to offer simple solutions to your decorating problems.